Hi. I was wondering if there will be a signals in game like it was in bfme 2. Its very comfortable option to have for example 3 signals to put on map so friends can see - red signal proposing offensive movement, green for defensive action and yellow for warning. Also i was thinking about the colours which players can take and which can help to see clearly which units are friendly. I love the option which allows to change all colours to three - dark blue and light blue to define you and your friends and red for enemies. It was implemented in game "supreme commander" working perfectly for me. Last edited by Syso on Tue Jan 15, 2019 5:09 pm, edited 1 time in total. Also i was thinking about the colours which players can take and which can help to see clearly which units are friendly. I love the option which allows to change all colours to three - dark blue and light blue to define you and your friend and red for enemies. It was implemented in game "supreme commander" working perfectly for me. I underwrite all of this. I would like to add another suggestion for this thread, and it's about any kind of speaking system support inside the game for team communication, specially when you are matched with online strangers in the same team and you can't speak with them via Skype, Discord or whatever. Maybe another solution for this could be a system of recorded or written requests and orders for your teammates, like it works on Age of Empires and other RTS games. Interesting ideas i must say, i like the signal color most. I'm sure there will at least be some type of signal system in place. That being said, such decisions are on the list of low priority at the moment. Not because the team doesn't find them important, but because there are far more crucial and complex tasks that have to be completed first. Note that this doesn't mean this isn't an interesting topic to talk about right now. When the time comes i'll be sure to share this thread if the team wants ideas and hopefully with a lot more discussion and reactions added to it! I even heard some idea of placing emotes into bfme game like it is in league of legends. This is not a good idea. To much is not good for visual contact with ur objects on map and even for game immersion. The game have to be smooth, elegant, just have what is most needed to play. This post is also a response to Enorue - with strangers u can communicate by writting messages or the signals which i mentioned. I think the in-game voice chat is to much. 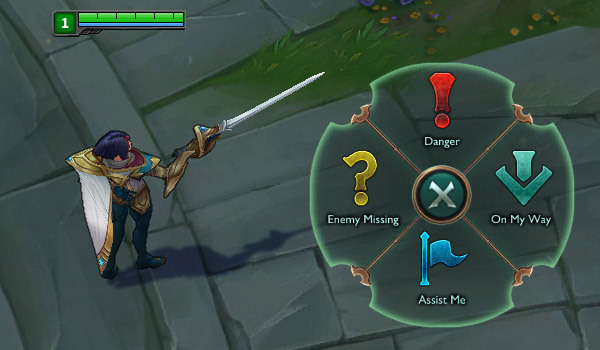 I sometimes play league of legends which have this implemented but i have never used that. When i want to talk with somebody i go for skype/teamspeak/discord. Even strangers got those programs and u can connect with them while u are in skirmish menu waiting for a game. Always when u want extra options added to game u can make or look for a mod which can be used to make u feel the game better in ur individual way.